The fifth, and penultimate, screening in our Classics on TV: Great American Playwrights season at BFI Southbank this month is of the 1986 Channel 4-PBS production of Clifford Odets’ play Rocket to the Moon, directed by John Jacobs (who is also credited with the 1958 BBC production of Strange Interlude from earlier in the season!) and featuring strong performances from Judy Davis and John Malkovich, as well as Connie Booth and Eli Wallach. Book your ticket on the BFI website here for the 6.00pm screening on Tuesday 27 January 2015. 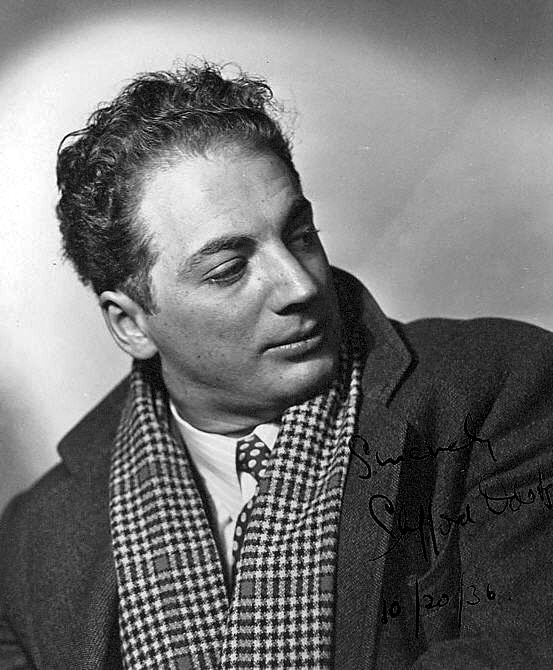 Born in 1906, Clifford Odets was a bit-part actor who joined the legendary Group Theatre for its first season in 1931. The ensemble, which included directors and writers as well as actors, was committed to developing a new technique of American acting founded on the teachings of the Russian director Constantin Stanislavsky. In a decade of productions, Group Theatre, whose members included Elia Kazan, Harold Clurman and Stella Adler, premiered many of the most significant inter-war American plays including Clifford Odets’ Broadway hit Golden Boy in 1937. Kicking his heels as an understudy with Group Theatre, Odets began to write plays, the first of which to be produced was Waiting for Lefty in January 1935. Inspired by a taxi strike at the time, the play famously climaxes with an impassioned speech for the characters, and by extension the audience, to declare a strike. It rhetorical power, coupled with the direct simplicity that is possible in its staging, meant that it quickly became a favoured play for left-wing theatre troupes across the country. By the time that Rocket to the Moon reached Broadway, Odets had been tempted to Hollywood, although he continued to write plays, including Clash by Night staged in 1941. Out west he worked uncredited on numerous scripts, including Frank Capra’s It’s a Wonderful Life (1946). He returned to Broadway with The Big Knife in 1949 and the 1950 hit The Country Girl, but his career declined after his co-operative appearance before the House Un-American Activities Committee in May 1952. At the time of his death a decade later he was writing scripts for NBC’s anthology drama series, The Richard Boone Show. It was not to be. Although the play had been performed by the left-wing British companies Rebel Players and Unity Theatre, a West End production had been refused a licence by the Lord Chamberlain’s office. Too late to prevent the Radio Times article, BBC Television also withdrew the production and it was replaced in the schedules by Hugh Griffith’s comedy Youth at the Helm. On 30 December 1958 Associated-Rediffusion contributed The Big Knife to the Play of the Week strand. Patrick McGoohan took the central role of Charles Castle, an actor who has compromised his artistic beliefs by the seduction of Hollywood. The following year BBC Television produced Clash by Night with Sam Wanamaker and Patricia Neal, shown on 7 July 1959. The television director of this production, like Rocket to the Moon three decades later, was John Jacobs. No archive copy is known to exist of any of these three productions from the 1950s. Odets’ witty and thoughtful play Rocket to the Moon is set in a New York dental office during a blisteringly hot summer in the late 1930s. The dentist Ben Stark (played by John Malkovich) is a good and generous man, sharing his offices with colleagues who are in no position to pay him rent. There is tension between him and his unhappy wife Belle (Connie Booth), who is somewhat broken by the experience of losing a baby at birth a few years earlier. Belle is naturally suspicious of Ben’s new secretary Cleo Singer (Judy Davis), a young, beautiful woman who prefers to go without stockings and wears more make-up than Belle thinks appropriate. Davis is pitch perfect in the role of naïve but spirited young woman. 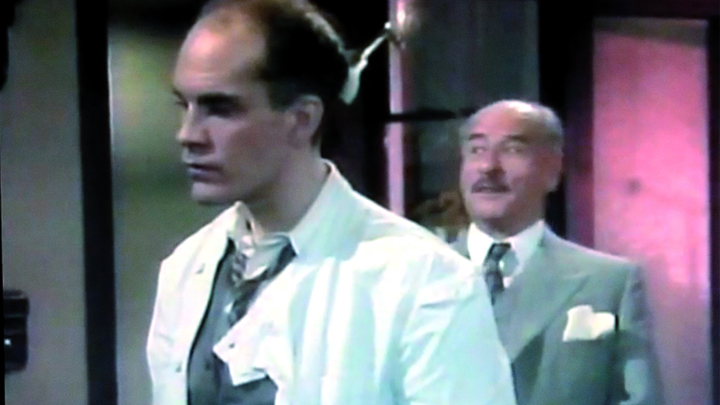 Belle is right to be suspicious: Cleo attracts the interest of her husband, but also that of her father, Mr Prince (Eli Wallach) – pictured above with Malkovich – who despairs of the dreariness of his son-in-law’s life and encourages him to ‘take a rocket to the moon – explode!’ The focus of this intense production gradually shifts from Ben’s mid-life crisis to Cleo’s burgeoning self-realisation, and the play offers us telling glimpses of Depression-era America. The production was produced in the UK and reflects the interest of Channel 4 in its early years (this was less than four years after its debut) to produce high-quality performance for the screen. In this case, a co-production deal with public television in New York ensured the budget to attract the high-calibre cast to what was one of the last major broadcasts of a theatre play to be recorded with multiple cameras in a studio. ‘…the play has none of the proscenium archness of many theatre-to-screen adaptations and it possesses an intensity which seems set to melt the glass. In a jewel-box crop of actors, John Malkovich plays Ben Stark, the dentist, Judy Davis his flossy hygenist and Connie Booth the wronged wife. The play has its fortune cookie moments but, at its best, establishes Odets as a lower-key Eugene O’Neill and this work as a shorter, jauntier day trip into night’ (‘Thursday’, The Sunday Times, 31 August 1986, p. 44). Read here a long review from a slightly less impressed critic, John J. O’Connor, writing in The New York Times, who laments the lack of profundity in the play, but concedes that it contained some fine performances and ‘bittersweet observations’ (‘Odets’s Rocket to the Moon on 13′, The New York Times, 5 May 1986). Details about the final screening in the series – the 1988 BBC-WNET production of George S. Kaufman and Moss Hart’s 1930 comedy Once in a Lifetime about three down-on-their-luck vaudeville performers who try their luck in Hollywood – can be read here. Also interesting was the success with which the piece was contained in the set – the dental surgery with its three rooms barely partitioned from each other, plus a few shots in the hallway outside. This never felt artificial though doubtless there would have been a temptation in a full cinematic treatment to ‘open things out’. In this version, it was enough to emphasise the general claustrophobia merely by starting with an outside shot with the hotel sign reflected in the surgery windows (though the very opening panning shot had a rather suspicious-looking background of city buildings). All told, I thought the physical constraints here went almost unnoticed in televisual terms, whereas in the Crucible transmission, the artificiality of having so many people turn up in Betty Parris’s bedroom (Act One) was more noticeable – presumably on stage one is less bothered by this sort of thing.